We are always looking to experience something exciting and unique during our visits to various ports of call. 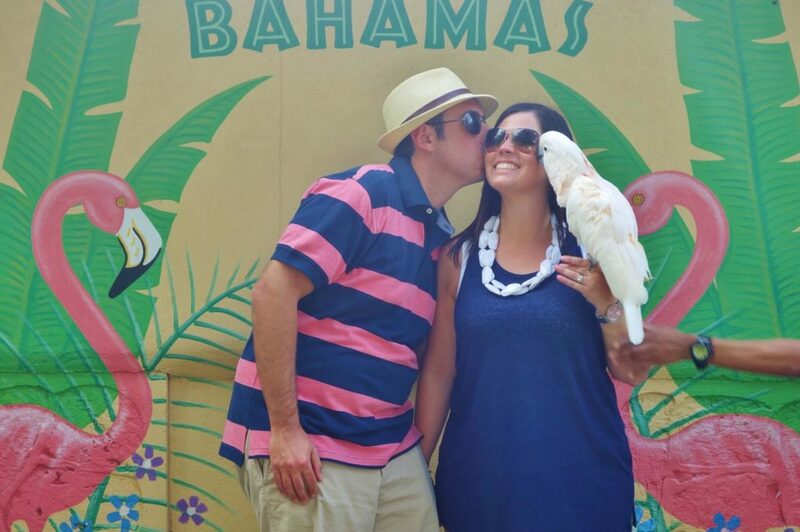 Our recent trip to Nassau, Bahamas on the Norwegian Escape was no different. 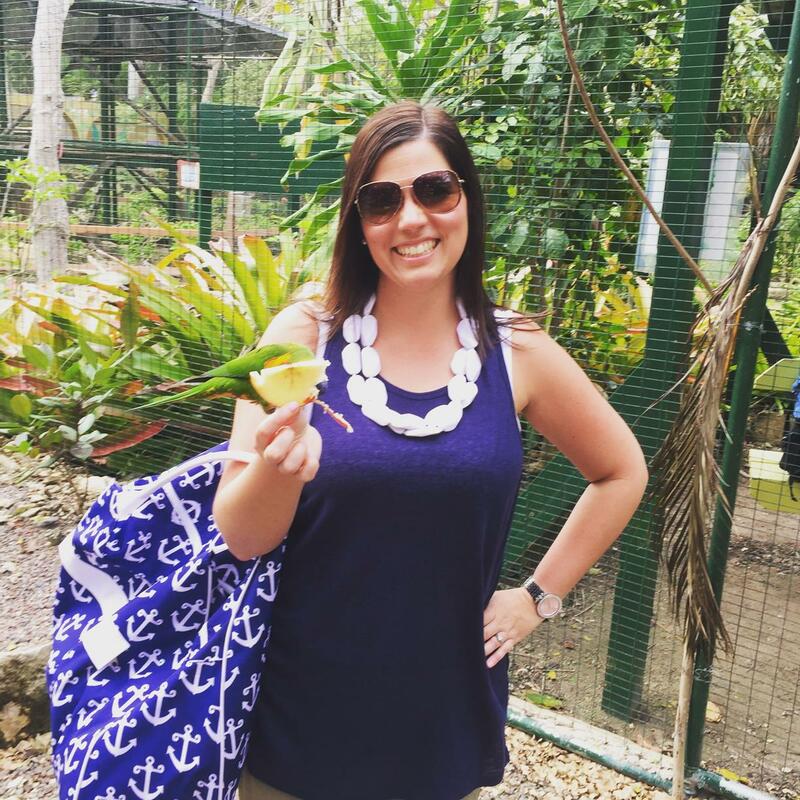 Having visited Nassau a few times in the past, we decided to take a walk on the wild side and visit Ardastra Gardens and Zoo this time around. This secluded reserve is a great departure from your typical cruise excursions, allowing you to interact directly with some beautiful creatures, many of which are native to the Bahamas. In fact, there are over 40 different exhibits with some two hundred animals to discover. 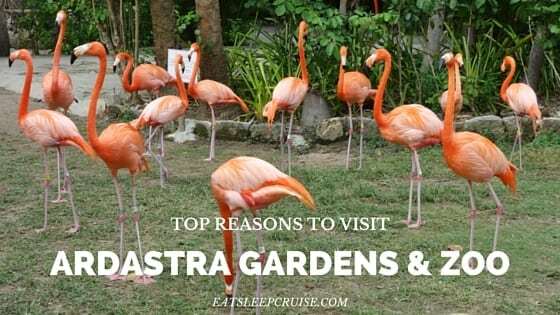 If the diversity of wildlife alone is not evidence enough that you should consider a stop at this hidden gem, then our Ten Reasons You Need to Visit Ardastra Gardens is sure to convince you that it is one of the best things to do in the Bahamas on a cruise. There are so many diverse species in these gardens that it can be a bit of an undertaking to see them all. Luckily, at Ardastra Gardens, many of the unique trees, shrubs, and flowers are labeled so that you can learn a bit about the species while taking pictures during your tour. 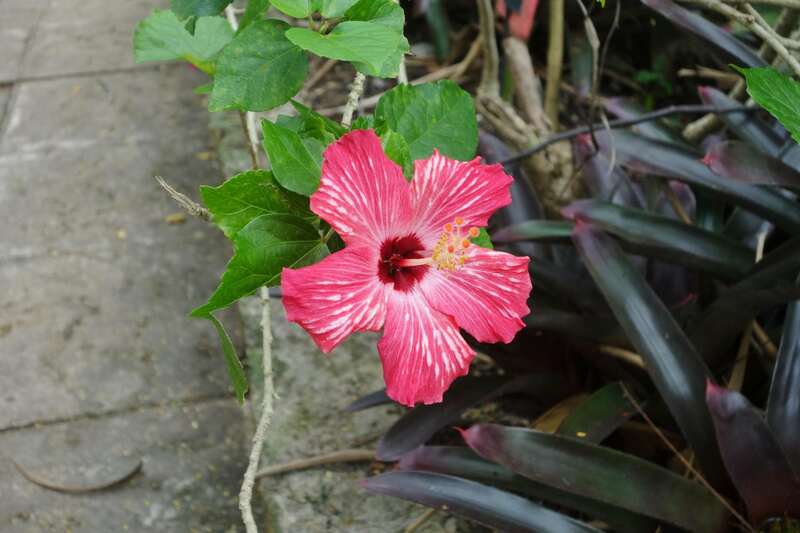 Different varietals of Hibiscus and orchids are among some of the more colorful plants scattered throughout the grounds. 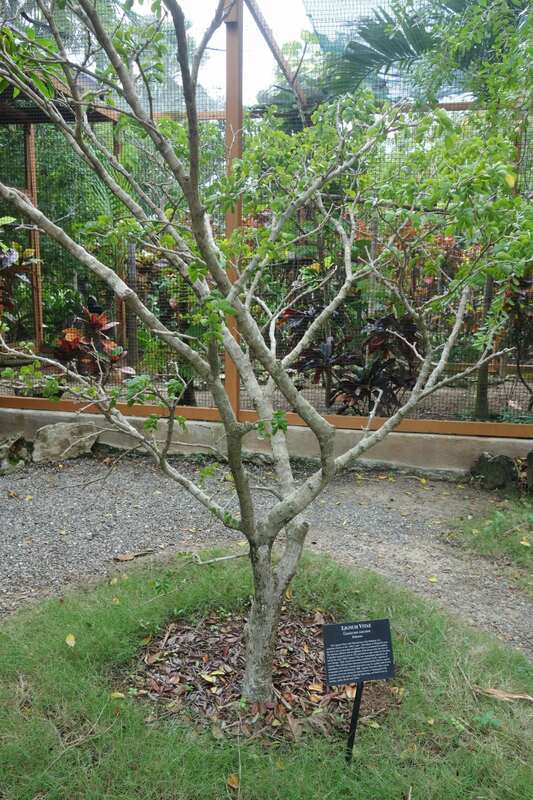 You can also get a great look at the national tree of the Bahamas, the Lignum Vitae. Also known as the Sailor’s Way, this plant was said to have curative powers. And for those who are a bit more versed in botany, you will certainly enjoy exploring the 4 acres of well manicured landscapes. You might just be surprised at the intelligence levels of some of the birds at Ardastra Gardens. Throughout the park, there are several birds who would love to strike up a conversation with you. 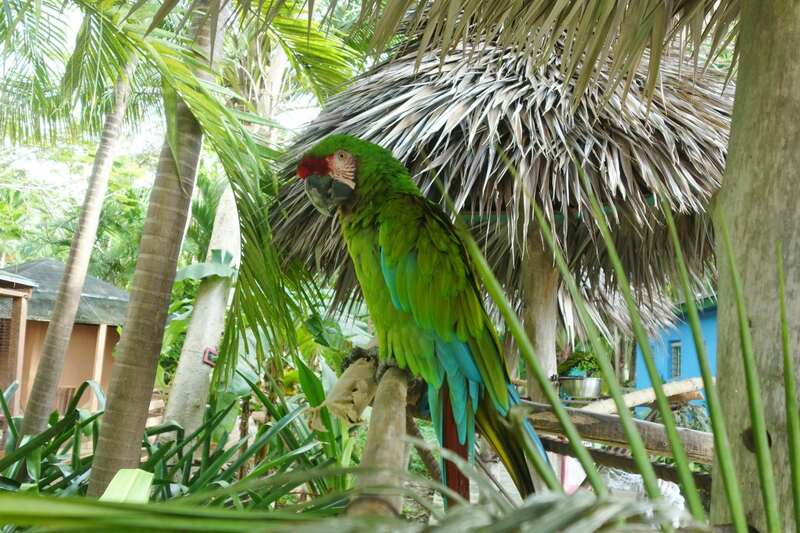 The Macaws, located near the exit, are known to be quite talkative. One in particular also enjoys doing a few tricks, if he is in the mood. The Eclectus Parrot towards the back of the park is also a talker. Although, a bit more shy than her cousins, you might get her to say “hi” or “bye” if you are lucky. 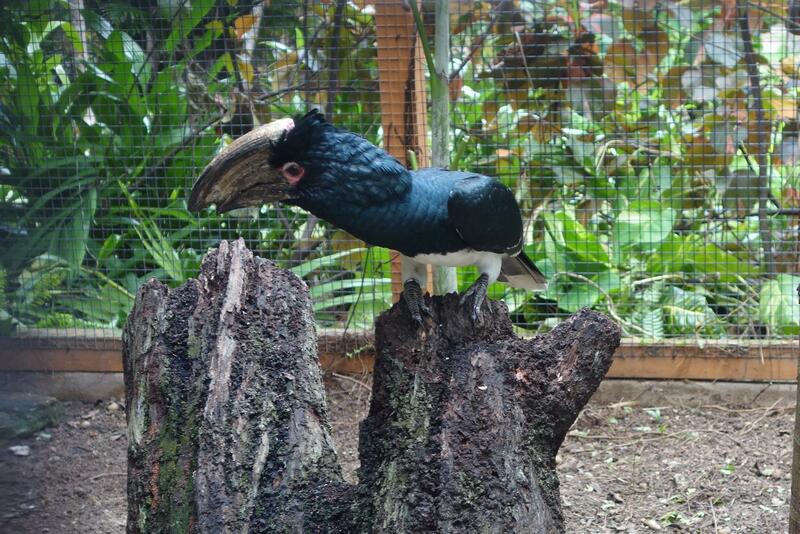 One of the most picture worthy birds at the gardens is the Trumpeter Hornbill. With its unique shaped bill, these birds can learn to do tricks like using rocks to break open nuts. These guys are not bashful and are happy for you to snap a few photos. 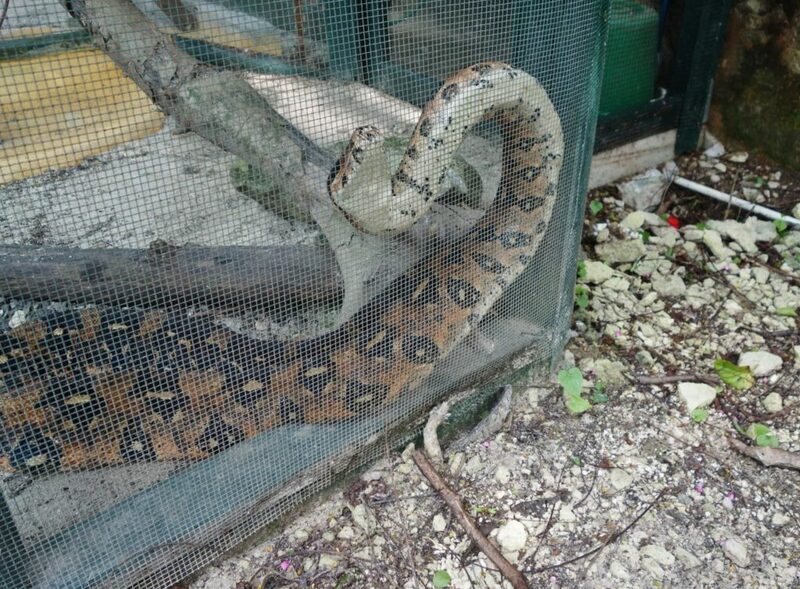 While the island does not have any poisonous snakes, you should be wary of the Bahamian Boa Constrictor. This impressive creature can reach up to 10 feet long and is found only in the Bahamas. At Ardastra Gardens and Zoo, this Boa Constrictor is confined to her cage, so you can see her in all her glory, along with some other boas, without the fear of becoming their next victim. 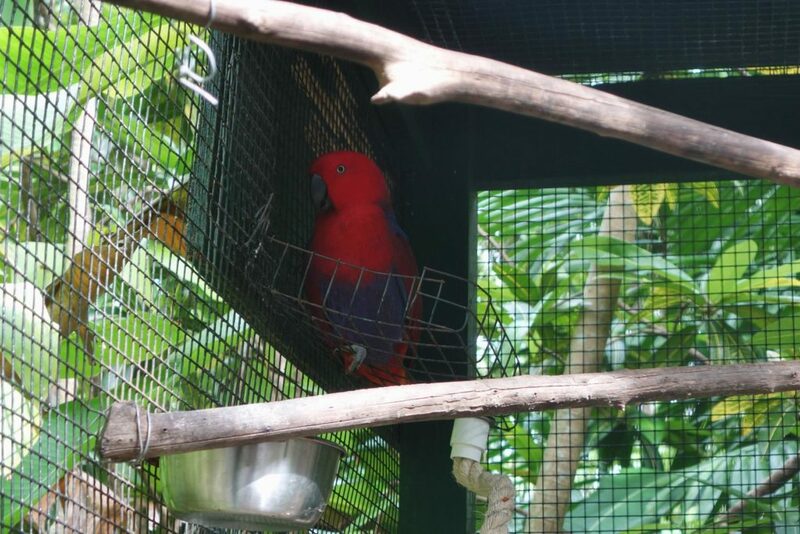 Time your trip to Ardastra Gardens and Zoo right so you are there for one of the Lory Parrot feedings. During this time, you can get up close and personal with these colorful birds. You can literally have them eating out of your hand! No experience is needed; once your enter their home, they are more than eager to meet you. Current feeding times are scheduled for 11am, 1:30pm, and 3:30pm. 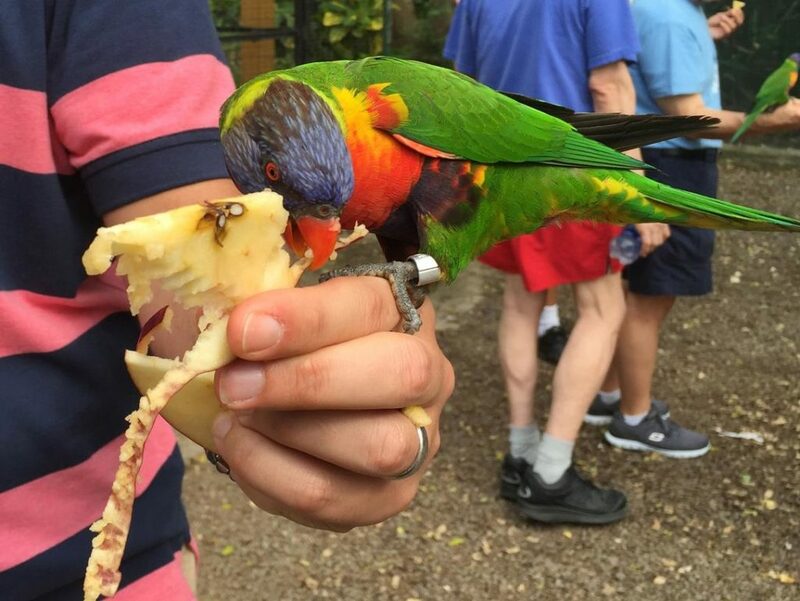 Apples are provided to all visitors who wish to partake in these feedings as the lorikeets’ brushed tip tongues are specialized for eating fruit. Just make sure to return the peel. There is no additional cost for this experience. 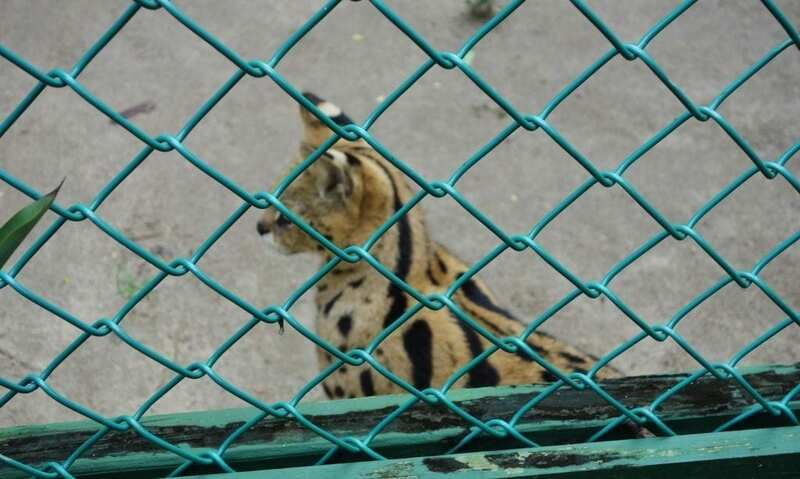 If you are a cat lover, then you have to stop by the Serval exhibit at Ardastra Gardens and Zoo. Ok, so you can’t really cuddle up with them, but you can get pretty close to these majestic African wild cats. Although it can prove to be a bit of a challenge, try to grab a few photos of these oddly portioned cats. Having the longest legs of any cat (relative to its body size) and a slender build, the serval can reach speeds of 50 mph and are also excellent jumpers. You may also notice the over-sized ears which give the serval excellent hearing (so they will know if you cat ladies are plotting to steal one for your carry-on). Yes, you read that right. Located deep within Ardastra Gardens is the largest rodent in the world. 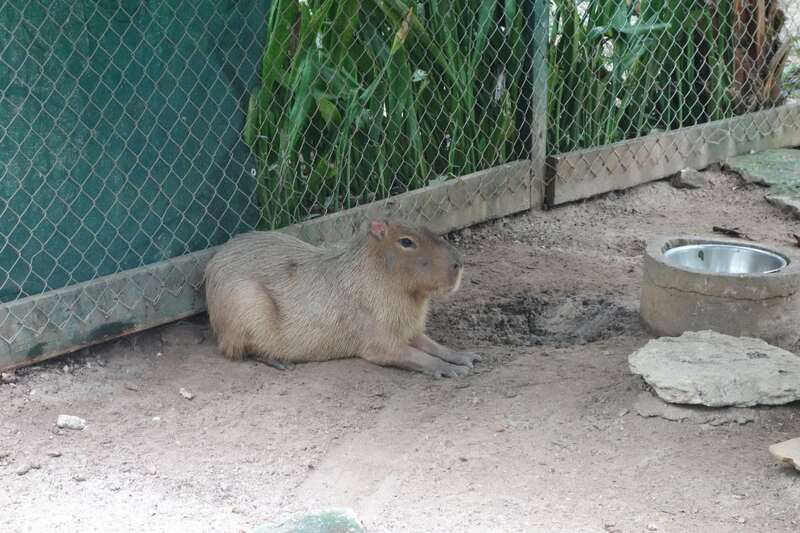 Towards the end of the zoo, you will find the capybara cage. Weighing an average of 100 pounds (or more), this rodent is more like the size of a mid-sized dog rather than a rat. Resembling a guinea pig (on steroids), the cabybara can get as big as four feet long. Don’t worry though because these guys munch mostly on plants and fruits. Mostly found in South America and rainforest-like habitats, you can get a glimpse of these impressive creatures during your visit to Ardastra Gardens and Zoo. They march on que and aren’t afraid of visitors. No, these are not soldiers, but Caribbean Flamingos. 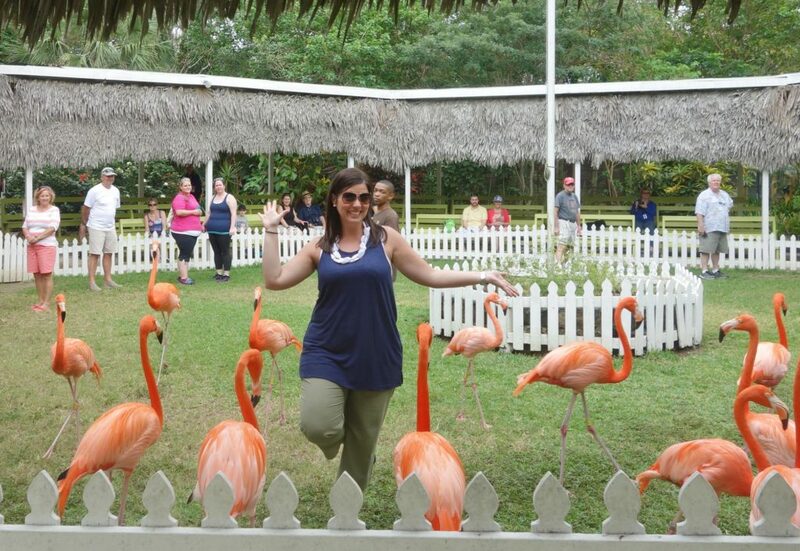 Yes, these pink birds, who get their color from the food they consume, put on quite a show at Ardastra Gardens and Zoo. Three times a day- 10:30am, 2:15pm, and 4:00pm, they march into the arena and perform alongside their trainer. Visitors can actually go into the arena during the show to pose with these well trained birds. Of course, the Princess was chosen to do her best “Flamingo Pose”. While not the most graceful, she pulled off a flamingo imitation of sorts. These world famous birds have been featured in National Geographic Magazine and were among the first animals to be brought to the zoo in the 1950s. At Ardastra Gardens and Zoo, pucker up for your chance to take photos with a Cockatoo. Near the exit, you have the opportunity to take a picture with one of the most intelligent and well trained animals at the zoo. During our trip, George the Cockatoo was offering a send off to guests as they departed from the park. Of course, not letting any photo opportunity pass her by, the Princess jumped right in to get a one of a kind picture. Word on the street is that George is a better kisser than me. I also hear he is better trained. Oh well! 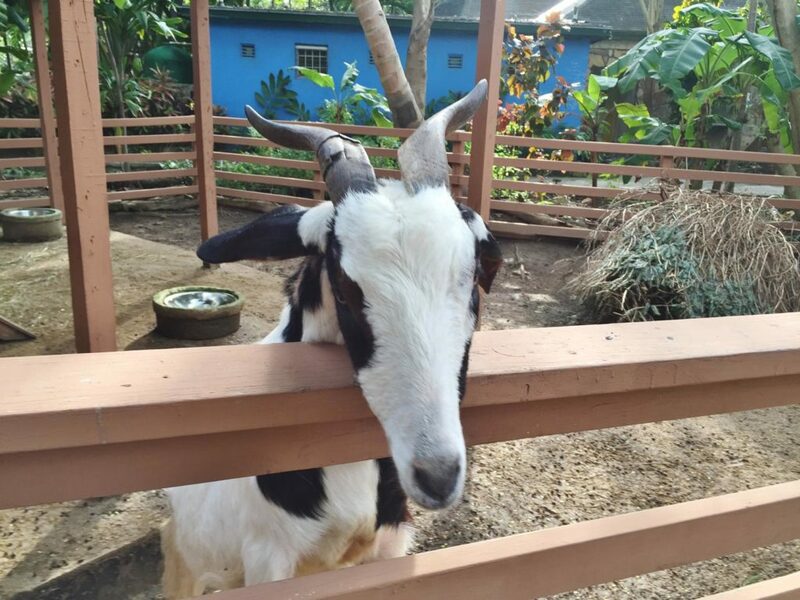 Just as you thought your visit to Ardastra Gardens and Zoo was coming to an end, there is the petting zoo, located right across from the snack bar and gift shop. With bunnies, pigs, sheep, goats, and more, guests have even more opportunities to interact directly with the animals. If you decide to feed these animals, do make sure to supervise your children because we encountered one rather aggressive goat who was trying to make sure he was the only one who got any food. I bought some food for $1.00 a bag to feed the goats, and they certainly weren’t camera shy. We actually had to “trick” the more dominant goat to ensure both animals got some of our treats. There are also a few celebrities roaming the grounds at Ardastra Gardens and Zoo. Pay close attention so you don’t miss them. 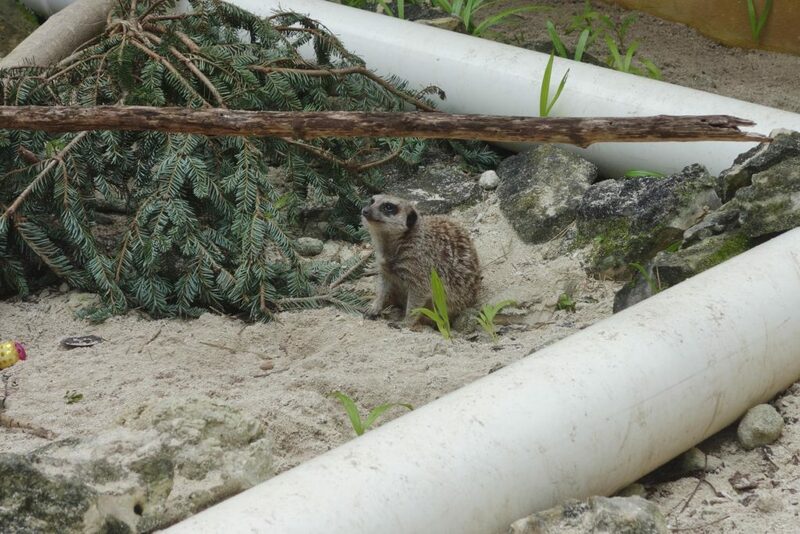 Towards the back of the park, you and the kids can sneak up on the one and only Timon (or meerkat) from the Disney animated classic “The Lion King”. Unfortunately, there is no Pumbaa, but be sure to check them out anyway and “have no worries for the rest of your days”. If you want more celebrity sightings, then you should stop by the almighty lair of King Julien from the Madagascar animated movies. 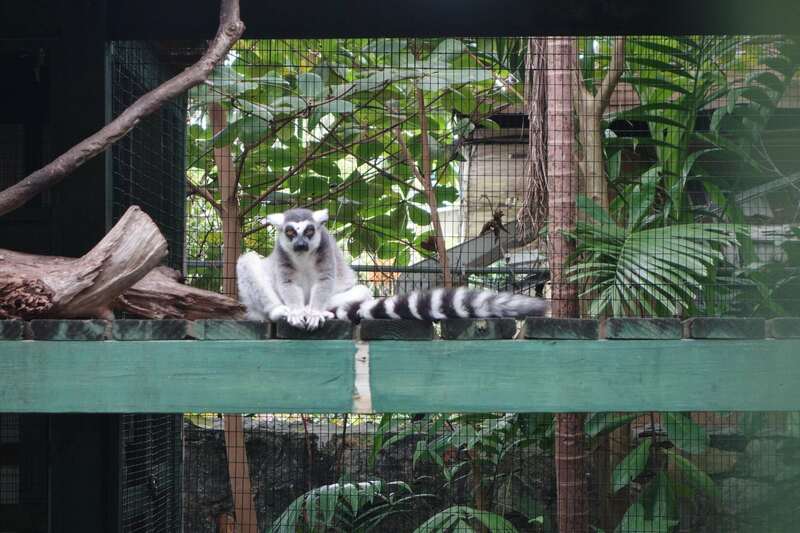 These lemurs are not shy and love to be photographed- what king doesn’t love the limelight? 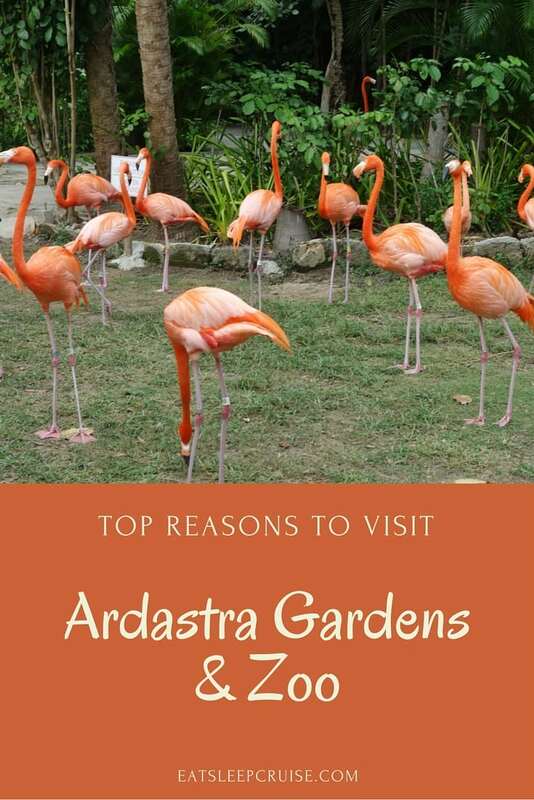 Whether you are traveling with kids, or are just big kids at heart like us, visiting these “celebrities” is a must during your time at Ardastra Gardens. It is relatively easy to get from the cruise port to the Ardastra Gardens and Zoo. A taxi from the terminal to the Gardens will run about $5-8 a person. For those of you who would rather enjoy the Bahamian weather, you can walk the approximately 1.5 miles to the gardens in about 30 minutes. Public transportation is also available. Once at Ardastra Gardens and Zoo, the admission is $18 for adults and $9 for children aged 4-12 (ages 3 and under are free). We were provided with complimentary admission in exchange for this review, but all opinions in this post are our own. 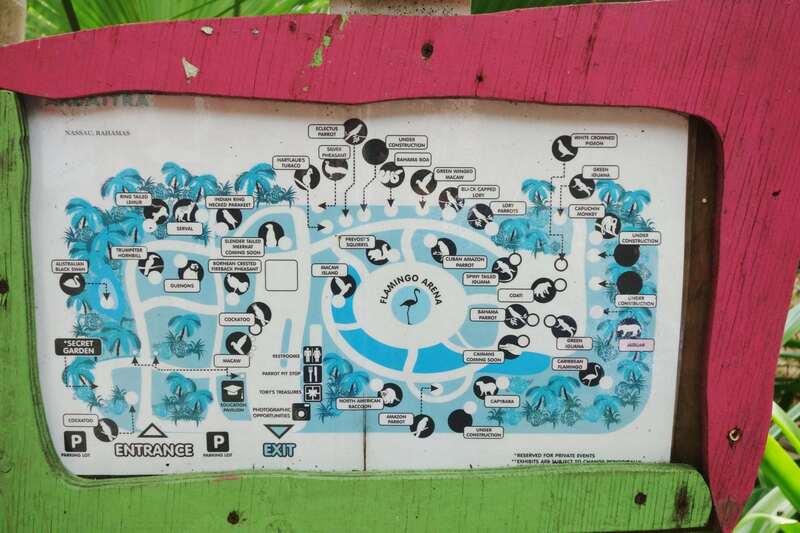 It is a self guided-tour, so be sure to grab a park map before you embark on your walk on the wild side. You can complete the full loop around the area, with plenty of time for the two shows and picture taking, in about two hours. Do be sure to plan your visit around the lory parrot feeding times and the marching of the flamingos as they only happen 3 times during the day. Near the end of the zoo, there is also a snack bar, gift shop, and petting zoo. So, grab a souvenir of your trip before leaving. Free Wi-Fi is available in this area as well so that you can share pictures on social media of you and the family interacting with all of the amazing animals. 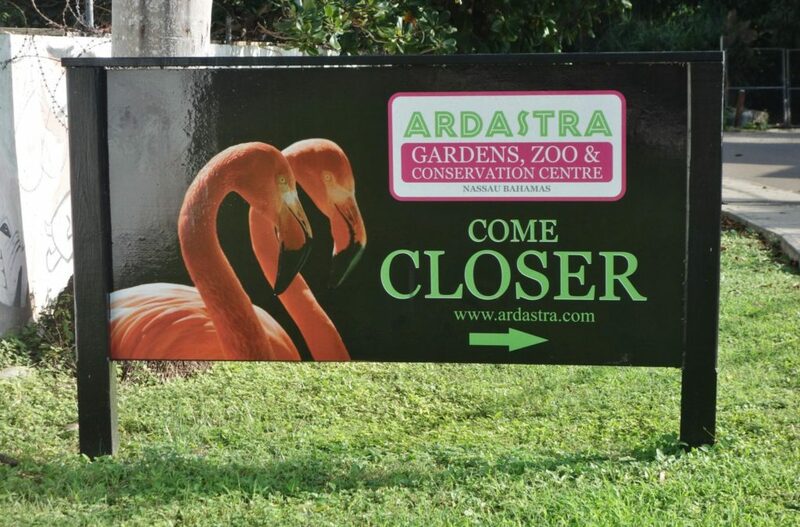 Have you visited Ardastra Gardens and Zoo while in Nassau, Bahamas? What is your favorite thing to do or see at this port of call? Drop us an anchor below to let us know about some of your experiences either at the Zoo or other unique island destinations. We weren’t very fond of it except for the flamingoes. Those poor cats in their 10 x 10 cages seemed to be cruel brutality.